This volume highlights the ways in which the prospect of peace can generate anxieties and consequently set in motion social and political processes that reproduce and reactivate conflicts. In analysing this issue, the volume builds on the notion of ontological security and its recent applications to international relations theory. Although conflicts threaten the physical security of the parties involved, they also help settle existential questions about basic parameters of life, being, and identity, and thus over time become sources of ontological security. The prospect of peace, through the resolution or transformation of conflict, threatens to unsettle the stability and consistency of self-narratives, and their associated routines and habits at the individual, group, and state levels. The contributors argue two key points: 1) that ontological insecurity may set in motion political and social processes that reproduce and reactivate conflicts; 2) that coping with peace anxieties necessitates the formulation of alternative self-narratives at the individual, societal, and state levels that re-situate the Self in relation to Other and to the world at large. 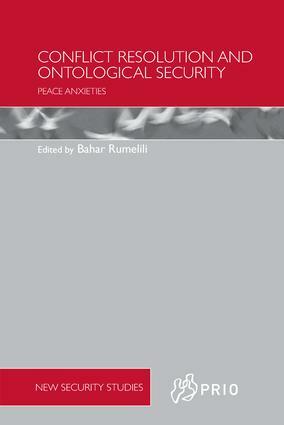 Consequently, the book analyses the ways in which, and the conditions under which, conflict resolution induces ontological insecurity, and the different ways in which ontological insecurity has prevented the successful culmination of peace processes in different conflict contexts, including Cyprus, Israel-Palestine and Northern Ireland. This book will be of much interest to students of critical security studies, conflict resolution, peace and conflict studies, social theory and IR in general. Bahar Rumelili is Associate Professor and Jean Monnet Chair in the Department of International Relations, Koç University, Turkey, and author of Constructing Regional Community and Order in Europe and Southeast Asia (2007).